Dress is a 3 piece (jacket, skirt with under-bodice, and cupcake skirt) and is in very good condition. Dress is smoke free. 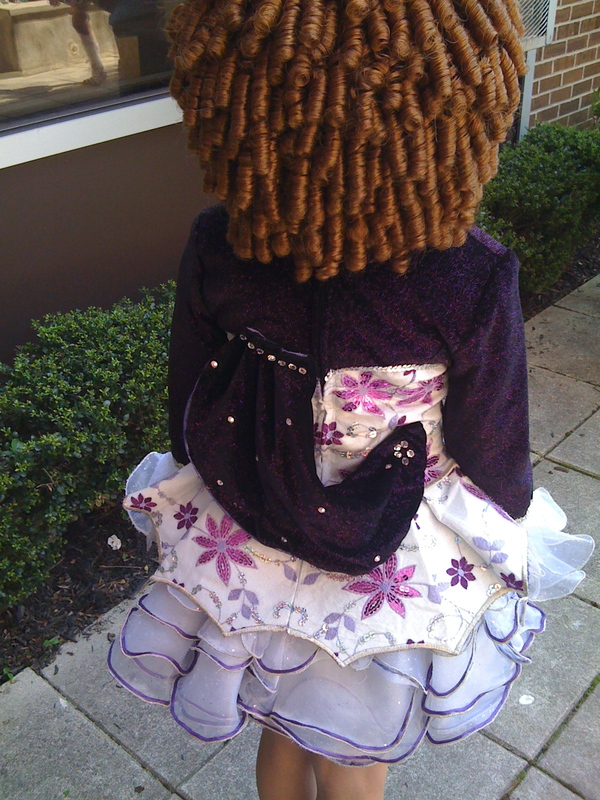 This dress was created with a growing dancer in mind and has the ability to change length quite easily. All fabrics were chosen to accept alterations well. 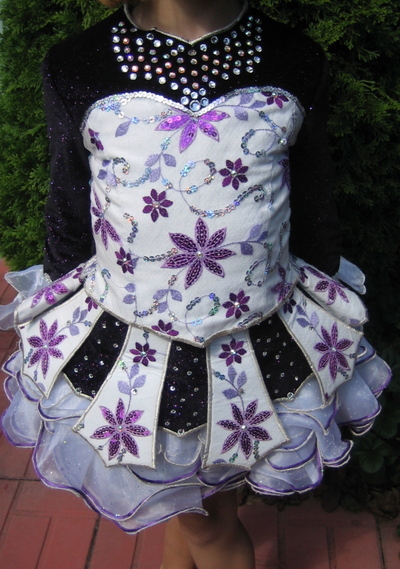 The dress is constructed of a dark purple sparkle velvet on the bodice, skirt, and cape. The white section is made with a lovely overlay imported for the dress from Hong Kong. The overlay is embroidery accented with sequins. The cupcake is separate from the dress in order to provide as much flexibility in length as possible and is on an elastic waist. The cupcake is a white organza with crystals throughout. Cupcake is 5 very fluffy layers, each edged with fishing line encased in silver thread. The bottom 4 layers have purple piping attached to add detail to the cupcake. The skirt is a 4 panel look and is attached to an under bodice which allows for the skirt length to be brought up or down more easily than a traditional 1 piece. The jacket currently has two layers of cupcake cuffs in order to add length. Again those are easily removed in order to shorten, and could be added back on later, one layer at a time. The jacket also includes a hidden number holder. The dress has been accented with many Swarovski crystals (clear and AB). 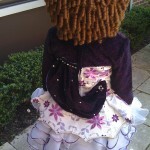 Dress will be sold with purple bloomers, two headbands (one is a purple flower one, the other is white with Swarovski crystals), and two custom created bags–one allows for the jacket and skirt to be stored together, the second bag will hold the jacket/skirt bag as well as the cupcake–this allows the cupcake to be transported with no fear of crushing it. The dress is currently worn by a 10 year old majors level dancers. She has worn it for 1.5 years. Dress is quite showy on a big stage and has been quite lucky for the current owner. The dress is located in Pittsburgh, USA. We will accept a return on the dress within 3 days for buyers within the US (buyer to pay all shipping charges). We will ship internationally but international sales will be final. Additional photos are available upon request. Please contact me with any questions. Depending on my daughter’s height I have added from 1″ to 5″ with the cupcake, and more could be added by lowering the cupcake. We pin the cupcake to her undershirt so that it sits at the correct spot for adding the right amount of length.